Purchase The Kid's Guide to Social Action here! Learn about Barbara A. Lewis! 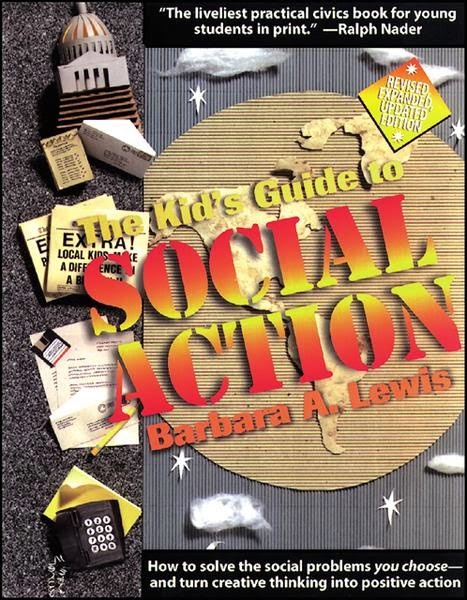 The Kid's Guide to Social Action by Barbara A. Lewis is a how-to book for kids interested in creating social change. This book outlines the steps needed to create social action; from defining the problem to evaluating whether a solution is working. KGSA also lists "power skills" useful to social activists, such as giving speeches, protesting and fundraising. Kids are even given the tools and steps on how to interact with local, state and federal governments. Throughout KGSA are inspiring true stories of kids who successfully created positive change, whether it was getting the state government to cleanup a toxic waste dump by their school or fundraising for a teen with leukemia in their town. It also contains a list of tools and resources that both teachers and students can use during their social projects. The Kid's Guide to Social Action is a great book for kids who are interested and ready to take social action. The book is full of tips, examples and resources that children would find helpful while creating social change. Students learn how to identify and research a problem, brainstorm solutions, spread awareness and find support and eventually carry out a solution. This book is also applicable to Element 5: Raising Awareness because it contains true stories of kids who fought for social justice. What makes KGSA an exceptionally useful book for the classroom is the fact that it doesn't tell kids what social issues they should change, but instead gives students the skills to identify social problems and come up with appropriate solutions on their own. This way, students can take action against what issues mean the most to them. Because of this, KGSA can be used in two ways; as an independent resource as students identify social issues throughout the year or in conjunction with a social justice unit - the book includes a list of social problems students can choose for an activism project. Although this book is most appropriate for children 10-13 as an independent text, it can still be used as a classroom resource for teachers of younger children. As mentioned before, the book is filled with printable tools such as a petition form and brainstorming worksheet. Want more? Check out this author's other books! "Uncle Willie and the Soup Kitchen"